1—As a matter of economic theory, if supply goes down, prices go up. Removing from the supply side what is estimated to be 5 million pounds of fake Kona coffee sold annually in Hawaii (that is, 5 million pounds in packages consisting of 90% foreign coffee with the name “Kona” prominently featured over and over again on the label—most of which is bought by visitors who believe they are buying “Kona Coffee”) this will cause both retail demand and farmgate prices for available genuine 100% Kona Coffee to go up—not down. See the Feldman study. 3—Kona Coffee Blends are the equivalent of fake Rolexes—“Rolex”/”Kona” on the outside, something very different on the inside. 4—If you take the juice from one orange and 9 lemons and call the product an “orange juice blend”, the result is consumer fraud. 5—Jamaica produces roughly the same amount of coffee annually as does Kona. For years the retail price of Jamaica Blue Mountain has been 25% to 30% higher than the price of 100% Kona. Why? It is not that Jamaica Blue Mountain coffee is better tasting—it is not. The difference is that Jamaica prohibits blending, and takes those who deceptively use the name of their coffee (including counterfeiters in the US) to court. Without having the supply side inflated by deceptive blends, Jamaica Blue Mountain is able to sustain much higher prices. 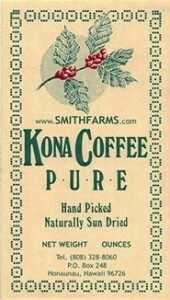 6—By selling what amounts to $5/lb coffee at a price of $15 to $25/lb by merely putting the word “Kona” prominently and repeatedly on the label, the Blenders are able to send an estimated $14.4 million each year in “excess profits” to their Mainland corporate owners. If blends were outlawed, this excess profit would go to farmers in the form of higher farmgate prices. $14.4 million divided by approximately 700 Kona coffee farmers indicates that the economic loss to the average Kona Coffee farm is more than $20,000 per year. See the Feldman study. 7—Nowhere on the label do the Blenders disclose to consumers that 90% of what is in the package is the cheapest commodity coffee available (often from Vietnam and other low end coffee producing regions). When the sophisticated writers at Consumers Reports can’t tell the difference between “Kona Coffee” and “10% Kona Blends”, it is not surprising that ordinary buyers are also deceived as to what is in a Kona Blend. 8—When consumers who have purchased what they believe is “Kona Coffee”, but is in fact 90% commodity coffee and are disappointed in the taste, the reputation of our heritage crop is damaged and farmers suffer economically. 9—Restaurants and hotels deceiving tourists into believing they are being offered “Kona Coffee” when it is 90% something else is no way to earn the goodwill of Mainland and foreign visitors. People don’t like to be cheated. This practice is bad for the tourism. Tourists like going places where they are treated fairly, not cheated. 10—The only way that the Blenders/processors can come up with a figure that they “represent” 700 Hawaii small coffee farmers is if they are taking the position that they “represent” all farms that a some point in the past have sold coffee to them. In fact, when it comes to economics, the interests of the Blenders/processors are directly adverse to the economic interests of farmers. Farmers want the highest price possible for their crop; the Blenders/processors want to pay the lowest price possible. The Blenders/processors do not represent farmers. 11—Even if the Blenders argument were correct (which it is not), is profit an excuse for fraud and deception? 12—Hawaii is the only region anywhere in the world that by law permits the use of the name of one of its premier agricultural products with only 10% genuine content.